Part of the fun of ice climbing is experimenting with the large variety of ice-climbing hand tools and learning how to use them. You can borrow, rent, or buy ice tools in order to discover which ones work best in your own climbing. Most ice tools have shorter shafts than the standard axes used in snow climbing. The short shaft, commonly 50 to 60 centimeters, helps in accurate placement of the pick and reduces the shaft vibration that can fatigue arm muscles. Ice tools that feature a hammer in place of the adze (fig. 14-3) often have a shaft length even shorter than other tools (as short as 35 centimeters). Fig. 14-3. 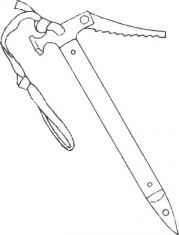 Typical ice hammers hammer. The adze chops and scrapes ice for steps, belay positions, or ice bollards; the hammer pounds in pieces of protection. 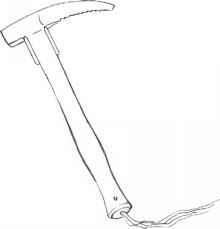 Some climbers prefer to hold the ice hammer in their dominant hand, which makes it easier to use in starting ice screws or placing ice and rock pitons. For a long and demanding ascent, some climbers bring along a third tool. 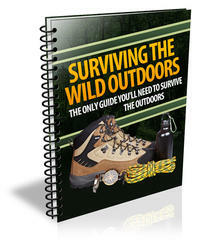 It can be used as an anchor at belay points, as a protection placement, or to replace a lost or broken tool. If your hand tools feature replaceable picks, you can carry a lightweight spare as insurance against a broken pick. To help in gripping the ice tools, you can wear gloves with rubberized palms or use tools with a covering on the shaft that improves the grip. Inspect your tools before each outing to see that adzes, picks, and spikes are as sharp as possible. Keep these sharp edges covered with guards when they're not in use. There is great variety in the styles of ice tools. Following are the principal design variations, categorized by the parts of the tool: pick, adze, shaft, and spike.